I LOVE Poutine, but it’s SO unhealthy. Actually I’m picky with my poutine, I prefer it certain ways and I won’t eat it from just any restaurant. 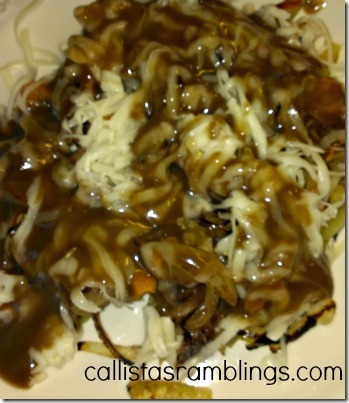 So when I was given the challenge of creating my own poutine dish and cleaning up afterwards with Dawn Dish Soap as part of being a P&G Mom, I decided it would be perfect, as I could make it the way I wanted. A few weeks later though I decided it was time to start losing weight and I started my own weight loss program. I’m proud to say I’ve lost 14lbs in less than 40 days. This also means however, that I’m trying to stay away from too many fattening foods. 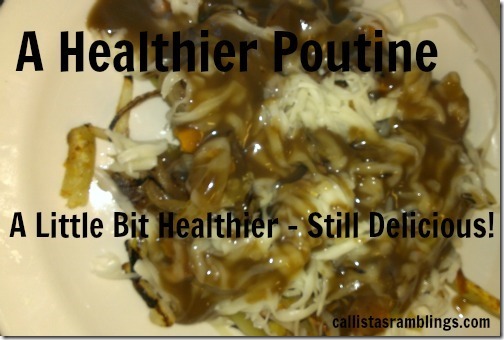 I finally decided to make a poutine as healthy as I could, without sacrificing taste. This is what I came up with. 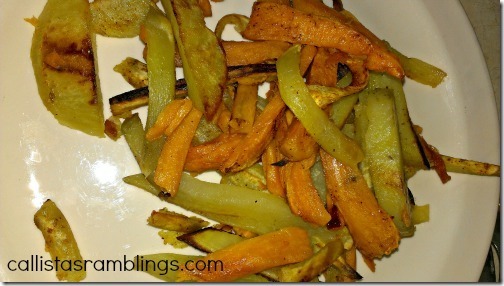 As with other food posts on this blog, you won’t find a full recipe below, as I Cook Without Recipes. I will give you just what you need to put together this dish the way you want. Will You be in or around Toronto on June 5? Stop by Dine and Dish With Dawn for a FREE poutine, as long as you wash it yourself with Dawn Dish Soap! Meet John Catucci from Food Network’s You Gotta Eat Here! Why did I use quotation marks? Well because you don’t HAVE to use potatoes at all. Potatoes are technically vegetables of course but they are very starchy and having lots of potatoes are not good for healthy living. I chose to use one sweet potato (healthier than a white potato), one red sweet potato (I’d never heard of this but found it at the store,) and two Yukon Gold potatoes (they are a lot smaller.) You might also want to try turnip or rutabaga. I also added sautéed onions because I just can’t get enough of them lately. You could certainly add any sautéed or steamed (healthier!) vegetables you want. I had thought of sweet peppers, tiny bits of broccoli or cauliflower, or perhaps shredded carrot. When the fries are done, take them out and put them on a plate. I like mine soft. 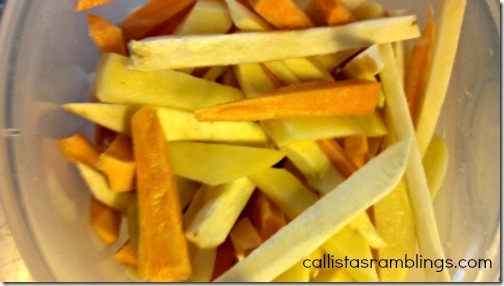 Step Four – Add Toppings and Eat! For the most part I really loved it. The only thing I would change next time I make it is to not use sweet potato. I generally don’t like sweet mixed with savoury. If you do though, you would enjoy it I’m sure. 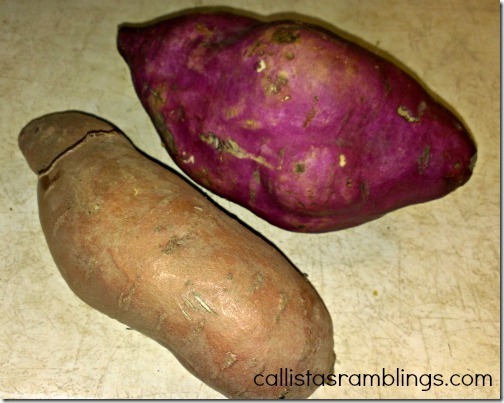 The red sweet potato tasted like a mix between a white potato and a turnip. I liked it! It’s not talked about a lot but after every meal, the dishes inevitably need to be cleaned. It’s best to do it right away, before the food hardens on. But if you are like me, after making and eating dinner,the last thing you want to do is dishes. If you do wait, you’ll need something strong to get the dried food off the dishes. May I suggest Dawn? 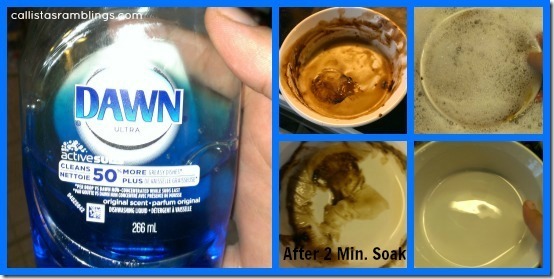 Dawn always does an amazing job and I don’t have to use as much detergent as the cheaper brands. Disclosure: As a P&G Mom (Brand Ambassador) I receive special perks and at times, compensation. For this post I was given a $50 Gift card to purchase the ingredients for my poutine dish and a small bottle of Dawn Dish detergent.